DACA deal or no deal? 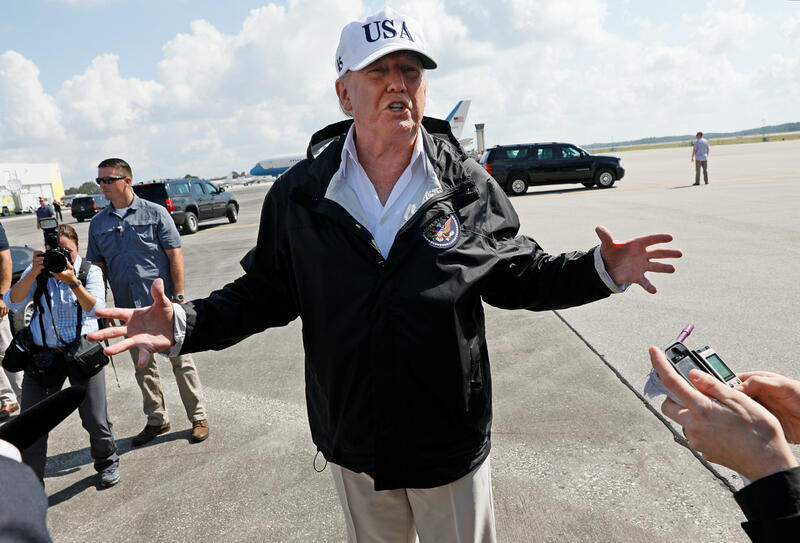 Upon his arrival in Florida, President Trump said the government is "looking at allowing people to stay here," and he told reporters that he's working with Democrats and Republicans alike on addressing the hundreds of thousands of undocumented immigrants brought to the U.S. as children. However, he also said of the Deferred Action for Childhood Arrivals program (DACA), "We're not looking at citizenship, we're not looking at amnesty." The president's dinner with Democratic leaders Nancy Pelosi and Chuck Schumer caused an uproar after the two Democrats issued a statement saying they had they had agreed to finalize a law "quickly" that would protect DACA recipients, and that the law would also include border security, "excluding the wall." "We agreed to enshrine the protections of DACA into law quickly, and to work out a package of border security, excluding the wall, that's acceptable to both sides," they said in their joint statement. Mr. Trump conceded as he left for Florida that his southern border wall would "be funded a little bit later," confirming in essence, that this would be separate from legislation on DACA and enhanced border security. But in Florida, he warned that he won't stand for seeing his wall blocked by Congress. "At some point they cannot obstruct the wall. The wall to me is vital," he said. "If I don't get the wall, then we will become the obstructionists." The president also said that he had spoken with House Speaker Paul Ryan and Senate Majority Leader Mitch McConnell about DACA, and McConnell said in statement Thursday that he looked forward to receiving the Trump administration's legislative proposal. McConnell's statement also said, "As Congress debates the best ways to address illegal immigration through strong border security and interior enforcement, DACA should be part of those discussions." Ryan contented that the president's conversation with Democratic leaders Wednesday night was not a negotiation, asserting that the president would have to work with the congressional majorities to get any kind of legislative solution. Ryan told reporters at his weekly news conference that he wouldn't bring a solution to the floor that doesn't have the support of the president. "There will be a compromise," Ryan vowed, that would include border security and enforcement. But he also said, "Our position has not changed," and he said that and his colleagues would negotiate -- "we're going to get our consensus." Early Thursday morning President Trump denied that his dinner with Pelosi and Schumer had resulted in a deal that would address the fate of undocumented immigrants who were brought to the U.S. as children under the Deferred Action for Childhood Arrivals program (DACA). "No deal was made last night on DACA," he tweeted early Thursday morning. The White House, however, did not mention any such deal excluding a border wall in its account from an anonymous official, and White House press secretary Sarah Huckabee Sanders disputed the Democrats' version of events. The Trump administration announced the end of DACA earlier this month, and Mr. Trump has given Congress six months to act. "President Donald Trump had a constructive working dinner with Senate and House Minority Leaders, Chuck Schumer and Nancy Pelosi as well as administration officials to discuss policy and legislative priorities," a White House official said in a statement. "These topics included tax reform, border security, DACA, infrastructure and trade. This is a positive step toward the president's strong commitment to bipartisan solutions for the issues most important to all Americans. The administration looks forward to continuing these conversations with leadership on both sides of the aisle." Thursday morning, Mr. Trump also tweeted, "The WALL, which is already under construction in the form of new renovation of old and existing fences and walls, will continue to be built." Then, he also seemed to suggest that DACA recipients deserved to be able to stay in the U.S., and that there should be increased border security, tweeting, "Does anybody really want to throw out good, educated and accomplished young people who have jobs, some serving in the military? Really!........They have been in our country for many years through no fault of their own - brought in by parents at young age. Plus BIG border security." But before departing for Florida on Thursday morning, the president told reporters that the border wall would be built "a little bit later." "We want to get massive border security and I think that both Nancy Pelosi and Chuck Schumer I think they agree with it, but we met last night and I think were fairly close but we have to get massive border security," he added. Asked if Republican leadership were in agreement with the plan, Mr. Trump told reporters, Mitch [McConnell] is on board, Paul Ryan is on board, 92 percent of the people agree on DACA, but we want very, very powerful border security." Sanders tweeted Wednesday night that, "excluding the wall was certainly not agreed to" when the Democrats' statement emerged. Matt House, communications director for Schumer, tweeted that Mr. Trump was clear he still wants a wall — he just said he won't require wall funding to be tethered to Dreamers. But, contrary to the White House's account, several moderates who met with the president earlier in the day said Mr. Trump had been talking about an immigration deal without border wall funding, CBS News' Walt Cronkite reported. In conversations with reporters at the Capitol Wednesday night, Rep. Josh Gottheimer, D-New Jersey, Rep. Kurt Schrader, D-Oregon, Rep. Tom Reed, R-New York; and Rep. Henry Cuellar, D-Texas, in a separate interview on CBSN, all said the basic parameters of the president's immigration deal with include provisions similar to the Dream Act, and include increased funding for border security, but not for a wall, which the president would pursue separately. The president was in favor of skills-based immigration vetting, and particularly a bill Sen Tom Cotton, R-Arkansas, and Sen. David Perdue, R-Georgia, have introduced, although Democrats pushed back on that concept somewhat. "The president also, did say also that the wall can … doesn't necessarily have to be with DACA, it can be somewhere else so he'll give that a shot somewhere else but to tie it in, I think we are all on the same page that we are not going to tie the wall to DACA," Cuellar said on CBSN Wednesday. Mr. Trump's seeming deal with Democrats comes after he sided with Democrats over his own party on a debt limit extension last week, shocking Republican leaders and even some in his own White House staff. The president's conversations with Democrats, along with his clearly expressed frustration with Speaker of the House Paul Ryan and Senate Majority Leader Mitch McConnell, seem to indicate he will continue pursuing Democrats to get things done in the future. Rep. Steve King, R-Iowa, a staunch conservative, called the president's purported DACA deal with Democrats, "Unbelievable." Sen. Chuck Grassley, R-Iowa, called the move an "undercut", tweeting to Mr. Trump to have his staff "brief" him on the matter. Meanwhile, Sen. Jeff Flake, R-Arizona, who has parted ways with the president on a handful of issues lately, praised the reported agreement. Gottheimer, co-chairman of the Problem Solvers Coalition, also told CBS News Mr. Trump asked the coalition to form a bipartisan commission on tax reform and infrastructure, and asked them to work on those issues with Gary Cohn, the president's top economic adviser. Schumer and Pelosi said they also talked with Mr. Trump about stabilizing health care markets, with Republicans unable to repeal and replace the Affordable Care Act, as Mr. Trump had pledged to do. "We also urged the president to make permanent the cost-sharing reduction payments, and those discussions will continue," the Pelosi-Schumer statement said. As Schumer took the Senate floor on Thursday, he called the meeting "constructive" and described the framework for a possible DACA program, something he said "we all agreed on." "We agreed that the president would support enshrining the DACA protection in the law. In fact, something he stated for a while needed to be done," said Schumer. He added, "What remains to be negotiated are the details of border security with a mutual goal of finalizing all the details as soon as possible. While both sides agree that the wall would not be any part of this agreement, the president made clear he intends to pursue it at a later time and we made clear that we would continue to oppose it." Schumer appeared to think that all parties could work together on an ideal border security package, adding that DACA legislation could "get to the floor quickly." CBS News' Nancy Cordes contributed to this report. This is a developing story. Please check back for latest updates.